Beginning over 60 million years ago, the geologic processes of uplift and erosion sculpted the mountain topography that influenced the creation of ecological communities, weather patterns, and the development of many natural resources. We often think of landscapes being stable and unchangeable, but weathering, erosion, and soil loss are continually in progress, and storm events that trigger landslides are but a reminder that the landscape is dynamic and constantly seeking equilibrium. Geologic processes and bedrock geology are the foundation of the landscape and form its template. Tectonic events beginning over a billion years ago influenced the morphology of the current template, creating varied rock types and complex structures that guide where mountains, valleys, streams, and rivers are developed. Similarly, the region’s soil and rich mineral resources come from the bedrock, which serves as the plumbing for the region’s groundwater resources. Geologists and other scientists throughout the world come here to study this mountainous region – its record of the Earth’s geologic history, landscape evolution, and its many mineral resources. The 1985 Geologic Map of North Carolina shows a generalized, but useful, view of the region’s geology, but much geologic mapping and research has been conducted since. 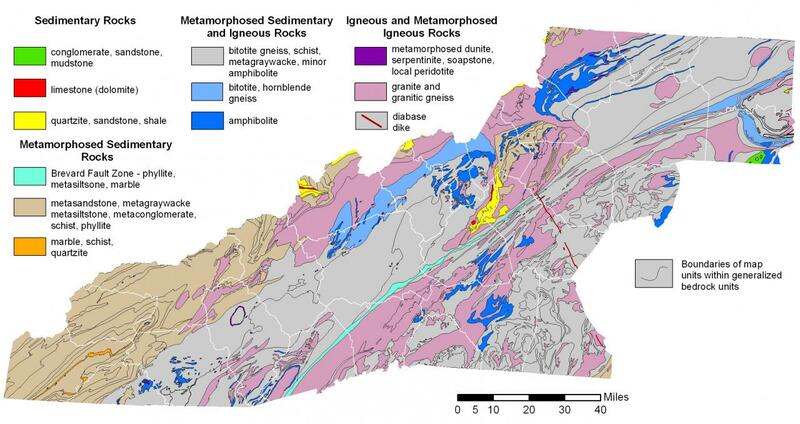 Although the basic geologic framework of Western North Carolina is reasonably well understood, less than half of the region has detailed geologic mapping. This section on geology and geomorphology gives examples of the kinds of information that can be derived from the 1985 Geologic Map of North Carolina and other available geologic data and research. This section highlights some of the geologic features, such as granitic rocks, acid-producing rocks, carbonate rocks (marble and dolomite), mafic and ultramafic rocks, and faults – all of which have distinct implications for our natural heritage, groundwater and mineral resources, and geologic hazards such as earthquakes, landslides, radon, and asbestos. The Blue Ridge and Piedmont geologic provinces are large composite thrust sheets of deformed (folded and faulted) rocks transported tens to hundreds of miles to the northwest during three Paleozoic mountain building events. Historically, the Brevard Fault Zone has served as the boundary between the Blue Ridge geologic province to the northwest and the Piedmont geologic province to the southeast, although there are similar rock types in each province. The exposed rocks now are, for the most part, the roots of an ancient mountain chain. They consist of primarily igneous and metamorphic rocks with lesser amounts of sedimentary rocks. The rocks record a complete cycle of continents forming, rifting apart, colliding, and then breaking up again into their present day configuration. The bulk of the rocks range in age from over 1 billion years old to about 500 million years old. Even the most recent rocks date back to around 200 million years old.